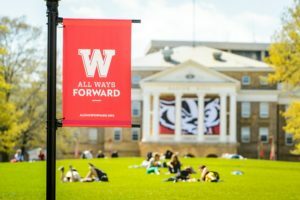 The staff of the Writing Center at the University of Wisconsin-Madison warmly welcomes you to our blog for a new academic year! 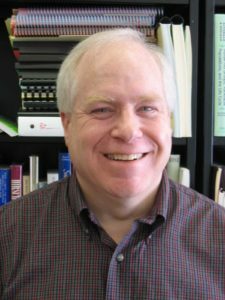 Brad Hughes is delighted to be starting his 34th year as director of the Writing Center and his 28th year as director of Writing Across the Curriculum at the University of Wisconsin-Madison. As in many other parts of the US, on August 21st eclipse fever touched many of us here in Madison, Wisconsin. In southern Wisconsin, the eclipse was, alas, not total–just about 85%. Even though it was cloudy that day in Madison, I joined a number of colleagues who had spontaneously gathered at the peak, a little after 1:00 PM, outside our campus building (Helen C. White Hall, which houses the undergraduate library, a number of academic departments, and the Writing Center) to see what we could see without ruining our eyes. We shared a pair of eclipse glasses, which, to my amazement, allowed us to view the eclipse through the clouds. It was stunning—like a crescent sun, I thought. And I loved the fact that it was a communal experience—as we shared the glasses, we talked and laughed and enjoyed each other’s company. What I especially liked about the eclipse was how it disrupted normal routines and allowed many viewers to see what is normally invisible to us—for those in the areas of a total eclipse, a rare chance of course to see the dazzling, mystical looking corona, the gaseous plasma surrounding the sun and other stars; and for those of us in regions with a partial eclipse, an equally rare chance to see a crescent sun, a shape I usually associate only with the moon. 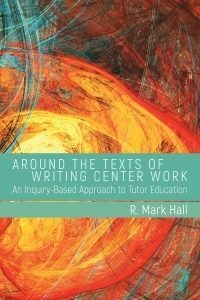 R. Mark Hall, Around the Texts of Writing Center Work (2017). In this post, I’d like to share examples of the topics for the ongoing education designed specifically for our graduate tutors and offer a few brief reflections about the history of this part of our tutor education. I will have more to say about this as part of a panel at the International Writing Centers Association conference in Chicago this November, when I will try to use activity theory to analyze the history of our writing center’s ongoing education topics. On that same panel, which is inspired by Mark Hall’s wonderful new book, Around the Texts of Writing Center Work (2017), my friend and colleague Mark Hall, from the University of Central Florida, will analyze writing center promotional documents using James Gee’s tools for discourse analysis, and my friend and colleague Rebecca Nowacek, from Marquette University, will analyze the role that session records play in prompting tutor reflection. At UW-Madison, our ongoing-education sessions started over 20 years ago. At the start, graduate tutors could choose from a short list of single-session conversations, which were designed and led by career staff in our Writing Center. The sessions focused on particular topics that tutors had told the Center’s leadership team that they wanted to learn more about and topics that the session leaders thought would deepen our tutors’ knowledge and strengthen the quality of our consulting. As you’ll see from the table below, over the years, some of these topics have remained similar—about helping science writers and about working with multilingual writers, for example. Another constant is that over the past 15 years, we have asked graduate tutors (TAs) in their second year on staff to complete their ongoing education by videotaping two of their consultations with undergraduate writers in the main Writing Center (with the writer’s and the tutor’s knowledge and consent, of course) and then to do a self-critique of those videos and then to meet to review and discuss those videos with a member of the Writing Center’s leadership team. With appropriate permissions, we then use some of those tapes in tutor education, staff meetings, and writing center research. 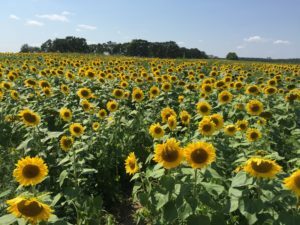 An August tradition, near Madison, Wisconsin–500,000 sunflowers in bloom, in the Pope Farm Conservancy. Photo credit: Elise Gold. But over the years, the sessions have also evolved in important ways. Our ongoing education now usually includes some reading and some writing and involves two different meetings, with some data gathering and writing and small projects in between. The ongoing-education groups often now produce new training materials, a policy statement, a panel at a regional or national writing center conference, a new Writing Center workshop, or a post for this blog, like a fabulous one this past spring, on building and strategizing diversity in the writing center, featuring the different voices of all the graduate tutors who participated. And I’m delighted that many of our ongoing-education sessions are now initiated and led by graduate tutors themselves. In fact, the TA assistant director of the Writing Center plans and coordinates all of our ongoing education for the year they are in that position. What better advanced learning experience could there be than planning and leading and evaluating ongoing education for peers? We try to design our ongoing-education sessions so that the total time commitment for the semester is about four-five hours, and we try to offer enough choices so that no ongoing-education group is larger than six or seven graduate tutors. I’m fascinated to see how the historical catalog of our ongoing-education topics reflects not only the rise of new technology within the teaching and practice and study of writing but also other fascinating new areas of interest for tutors AND for those who propose and lead tutor education. There’s a lot to notice, I’m convinced, within these topics: they mirror trends within composition and rhetoric and within writing center studies, shifting emphases for our university and within higher education more generally, and national and international trends in culture and politics. Within our particular program, they also reveal tensions between theory and practice and a subtle competition for participants. Here’s a selected history of the over 20 years of topics for our ongoing education for graduate tutors. What Does a “Growth Mindset” Have to Do with Our Work with Student-Writers? Fall 2016 Empirical Research in the Writing Center--What's So RAD about It? Visualization: What Is It Good For? Fall 1998 What’s Different about Writing in the Sciences? 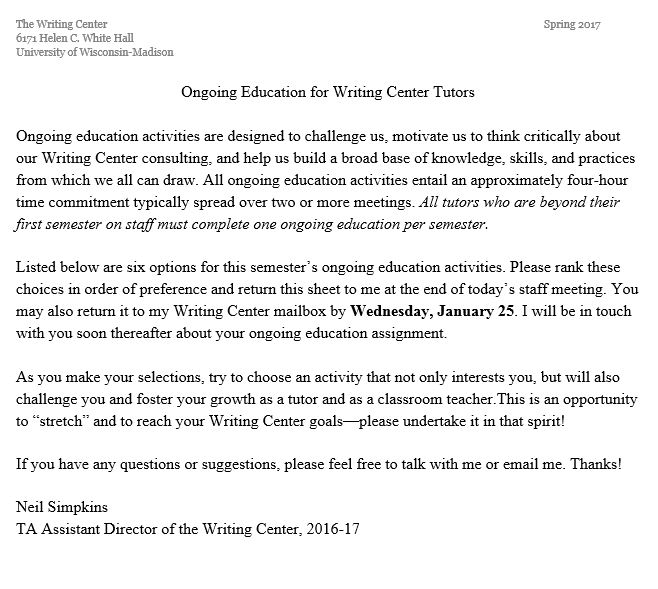 Page 1 of descriptions of spring 2017 ongoing-education topics for graduate tutors at the UW-Madison Writing Center. Page 2 of descriptions of spring 2017 ongoing-education topics for graduate tutors at the UW-Madison Writing Center. I want to thank my many wonderful colleagues over the decades for proposing and developing and leading these ongoing-education sessions. And I want to thank them for always thinking critically about how we approach professional development. I also want to thank the hundreds of smart, engaged graduate tutors who participated in these sessions and created new knowledge through their writing, their data collection, and their conversation. And thanks so much to all of you who are reading this post! If you can spare a minute, I hope that you will add a comment–I really mean it:-). Any reactions to this brief history of ongoing-education topics? If you have participated in some of these, what do you like about them? What could be better? If you’d led one, what did you enjoy about and learn from that? If you are from another college or university or high school, what does your writing center do for ongoing education or professional development for tutors beyond their initial course or training or workshops? Any suggestions for new approaches or topics? Thanks so much for reading and for sharing your thoughts and experience and questions. Your observation about the eclipse disrupting routine and allowing us to see the world in new ways immediately reminded me of the experience I had reading R. Mark Hall’s new book–thinking about my writing center work through the lens of activity systems really did help me to see my tutoring in a totally new way. Indeed, that is what ongoing education at the writing center of often yields for me–participating in these every semester safeguards me from falling into a comfortable , uncritical routine and always leaves me energized and excited about returning to the writing center with new insights. Thanks for this historical look at ongoing education, Brad! Like Maggie, I also appreciate your willingness to extract writing-center relevance from this August’s eclipse. 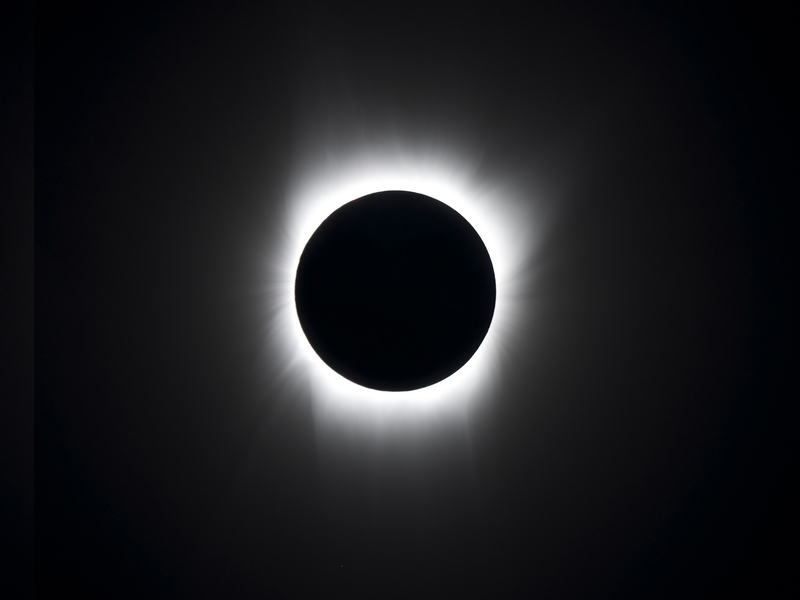 In thinking about other connections between that cosmic occurrence and the work of planning and actualizing professional development events, I’m drawn to what you said about the communal aspect of your eclipse experience. I wonder if an argument could be made that professional development can do the same kind of togetherness work that you experienced while watching the eclipse. It may matter a lot that the professional development model you write about is not a solo enterprise. People aren’t reading writing center articles by themselves; they are coming together to collectively consider and discuss an issue. Especially in the context of a very busy writing center with multiple locations spread across a large campus, it’s very easy to work a tutoring shift and not connect with other writing center colleagues at all. Perhaps one of the additional benefits of professional development is its capacity to bring commonly curious people together. Thanks Brad. I love the paradoxical image of illumination through obscuring–that eclipsing the ways we normally see things allows us to produce new and valuable knowledge. An important thing that ongoing education illuminates is that, while the one-on-one writing session is the foundation of what we do, the writing center is also a locus in which so many important social issues reveal themselves, issues that would seem to lie beyond the domain of the WC. As the titles of those OGEs suggest, WC experiences make visible the politics of race, gender, sexual orientation, and second language acquisition and the assumptions we make based on those categories. WC experiences reveal psychological and social barriers to success such as stress, fixed mindsets, and fallacies about how learning happens. Addressing these challenges through OGEs allows us to have a more positive impact on the wide diversity of students we see, helping us learn from the very human and social issues that emerge in Writing Centers everyday. Thanks for sharing, Brad. It’s impressive to see the expansion of ongoing education over the years and the wide array of topics, especially in the past three years. As a participant in the growth mindset sessions, I really enjoyed our discussions about the how different types of praise (person-praise; process-praise) and feedback we give writers might affect their attitudes toward their own writing and ability to improve. I also found our discussions helpful for my own reflection and rethinking about how to help writers appreciate their own growth, and articulating that growth, in an actual conference. Since the growth mindset sessions last spring, I’ve challenged myself to make more time, especially at the end of sessions, for writers to discuss what they’ve learned (e.g. how they’ve grown) during the session and how they’ll apply what they’ve learned going forward. In any particular session where we have a lot to work on with a writer, I think it can be easy to pay less attention to what the writer is learning. We might ignore that because we’re so focused on the writer’s product. I really valued the OGE meetings as a space to think about how to help writer’s reflect on their growth in actual sessions. I really valued all of my training experiences in the UW-Madison Writing Center. They were all great learning experiences. I think the most influencial OGE was to record and watch one of my tutoring sessions. Sure, watching and hearing myself on film wasn’t much fun, but it gave me a highly personal/ized perspective on my strengths and, especially, weaknesses as a tutor. But the most helpful part was sitting down with Brad, who’d watched it, and sharing our responses and getting his feedback. I didn’t really realize this then, but our conversation marked a turning point in my development as a tutor. I’m still working on implementing Brad’s suggestions, and as I do, I remember what I learned about (my) tutoring from him. Talk about an ongoing education! What goes around comes around: one of the most influential OGE’s for me was my recording and reflection session with *you*, Dave! I remember that we watched a session or two I didn’t think had gone particularly well, and you encouraged me to notice the moments where I could improve but also to learn, forgive, and move on – and to be sure to notice the things that went well so that I could deliberately replicate them in the future. That’s something I really came to value about the OGE sessions. They don’t just provide an opportunity to connect with other tutors and incorporate new perspectives into our teaching. Because there were multiple sessions, because we had choice in session theme, and because we engaged in them frequently, they offered space to make sure that our philosophies and pedagogies developed deliberately and sophisticatedly. Thanks so much for this post, Brad! Since we’re all reminiscing, I’d say that I still use some of the strategies from a visualization OGE I did years ago, I think with Jessie Reeder. In just three days of meeting with my first year writing students I’ve asked them to draw the relationship between genre, audience, and purpose, and we’ve used Venn diagrams as a way of crystallizing (hopefully – we’ll see what happens when they start writing!) students’ understanding of the genre of the profile. And in my own writing, that practice in representing concepts visually has been invaluable. More broadly, I continue to be so grateful for my time at the Writing Center. The professional development I got through the Writing Center was among the most useful of my time in graduate school, and I especially appreciated a feature that Brad points out here – that these sessions were both practical and grounded in theory. Thanks, as always, for sharing Brad. As one who was a UW writing tutor many years ago, I always read Brad’s posts with considerable nostalgia for those wonderful days at Wisconsin’s amazing writing center led by the singular Brad Hughes. I also read them with more than a little envy: “Oh, how I wish I had access to that energy and those resources again!” Which leads me to a very selfish request. You write, Brad: “the ongoing-education groups often now produce new training materials, a policy statement, a panel at a regional or national writing center conference, a new Writing Center workshop, or a post for this blog, like a fabulous one this past spring, on building and strategizing diversity in the writing center, featuring the different voices of all the graduate tutors who participated.” As I scrolled down the list of topics over the years, I kept saying to myself: “Would love to see the results of that group, would really love to see the results of that group, etc.” I realize one of the benefits of these groups is that members can take their results in the many different ways you describe above: produce new training materials, present at a conference, etc. Here’s where the selfish request comes in. Might it be possible to, um, “strongly encourage” as many groups as possible to post their findings – the questions they discussed, the tentative conclusions they may have reached, the resources they found useful — to this site? I can’t tell you how much I would love to be able to read the conclusions that a group of thoughtful UW writing tutors arrived at after examining a topic for several weeks. Yes, I might hear their findings at a conference. But chances are, I probably will not… A blog post, however, can be easily accessed at any time. Thanks, as always, Brad, for this post. And thanks even more for your ability to continue to innovate and inspire. Bryan, I second both your nostalgia and your desire to hear from the graduate tutors who experienced this training. Maybe that is a future ongoing education topic: How to not only use but disseminate knowledge gained through professional development. I’ll chime in here since I too share Bryan’s nostalgia for our wonderful years together in the UW Writing Center with Brad and many of you who’ve read and commented on his post. At the risk of a lame 90s Tom Cruise movie reference, Brad “had me” at “historical catalog of our ongoing-education topics”! I remember being part of many of those early OGE sessions like the one on email tutoring, which now seems quaint but was pivotal for sparking my interest in writing center technologies. My nostalgia grows as I read these comments from Bryan, Matthew, Jody, John, Eli, and Neal—folks I worked with or met during our “wonder years” at UW (okay, enough 90s pop culture). Being part of that writing center community of continual inquiry and reflective practice—in which members were respected and invited not only to participate, but also to lead—was the most fundamental part of my own graduate education and continues to inspire the kinds of tutor education and professional development we create here at the University of Minnesota. And coming late to this blog conversation, I think I’m seeing the realization of Bryan’s desire for more OGE topics and materials to appear in the Another Word blog in the form Leah Pope Parker’s latest post. I’m honored to keep learning with all of you. Thanks, Brad, for this post. I know it represents hundreds of your hours–coaching, reflecting, and observing tutors at various stages of expertise. As you were talking about the eclipse, I was thinking about the way you always put others ahead & in front of you–and yet your corona shines all around. I love your comment, Eli, about Brad’s always putting others ahead of and in front of him. So true and so beautifully said. This is great, Brad. I especially appreciate having this topics list and the shot of the familiar form with the OGE descriptions. It highlights for me how many different ways writing center administrators can set up opportunities for us all to learn from one another. I learned so much from the initial training I received when I started working in the Writing Center at UW, the one-on-one meetings I had with you, Brad, the wonderful conversations I had between sessions with my coworkers in the Writing Center, the well-planned staff meetings, and the OGE options I pursued in a small-group discussion setting. Each of these venues provided a unique angle on the work we were doing and created special opportunities for reflection and a deepening of our understanding of that work. I love that variety, and it’s something I’m always working to foster in our Writing Center at Notre Dame. Thank you! I also want to echo Bryan’s request for more blog posts about the proceedings in these OGE meetings. I’ve benefited tremendously from the posts on this site, and I’d love to have more windows into the smart conversations happening in the OGE program! Great stuff as always, Brad. It’s really interesting for me to see the familiar topics but also new subjects that your staff has chosen to focus on over the last 20 years. I agree that the list is a microcosm of the interests and concerns of the larger field, whether outside the UW Madison Writing Center or in writing studies more generally. It’s a great example of how centers need to be agile to address current issues but also how some topics (technology, language, the dynamics of a tutoring relationship) are ever-present–and by no means fully figured out. I look forward to your update on this blog post 20 years hence! Thanks, Brad, for a fascinating look at two decades of continuing staff education at the UW-Madison Writing Center! As someone who participated in “Advanced TA Training” (as we called it then) in the late 1990s where the timeline begins, your post brought back fond memories: I remember considering how to help at-risk undergraduates with Janet Fishbain; exploring writing in the sciences with Mary Berthold; and discussing strategies for assisting English Language Learners with Joyce Sexton. I found those sessions invaluable opportunities to benefit from the wisdom and experience of the Writing Center’s wonderful professional staff while also collaborating with graduate student colleagues. Our discussions still inform my thinking about my writing center teaching, and the handouts provided have found their way into staff education in my current Writing Center. Beyond the eclipse of time, the corona of staff education at UW-Madison shines brightly! Cool idea, Brad, to have the ongoing education sessions span multiple real-time meetings and include readings, etc. Gives them the potential, it seems to me, to have more deep engagement with a given topic (with the shared reading plus more time) and, like you’ve experienced, to result in the creation of collaboratively-produced resources or documents/statements. We may steal this idea at DePaul at some point! We currently do more of a pick-one-of-3-90-minute-sessions-each-quarter thing for our staff, so we could explore keeping that choice and then also offering the more small-group, meeting-multiple-times thing you all do and just mapping that on to our current policy and pay structures (like a group could meet once per quarter over the AY, for 3 total meetings). I also like the simple idea of having folks rank-order 3 preferred topics from a longer list. Gives people more buy-in, knowing they chose their topic, rather than attending only the handful of sessions you offer? Question/clarification: you still run all the sessions, even if one only has a couple folks? That’s a good question, Matthew. Once in a long while we will cancel one offering if there’s not much interest, but almost always we run all of them–we usually can easily get at least four tutors in each while still giving all the tutors either their first or their second choice. Thanks, Brad, for sharing this view into professional development. You’ve got me thinking about the relationship between curriculum development and the many in-person, interactional, relational, and often-improvisational moments that add up to writing center pedagogy. It’s also fun to see how Another Word has continued over the years and made space for professional blogging. Thank you for this work. Thanks, Brad, for sharing this overview of ongoing education! I can say from experience that it’s not until you’ve helped plan ongoing education that you realize how organized and intentional it is, drawing on years of institutional knowledge while also responding to new challenges. One argument I hear you making subtly is that ongoing education is essential to running a healthy writing program. I wholeheartedly agree. I’ve also noticed that people who run ongoing education occasionally have to persuade participants that this is so, and I think I hear you making your case to them too. And I suppose this response (present in every workplace I’ve ever been part of) makes a little sense: when people are new at something, they really want to be trained; when they’ve done something for a while, they feel like they’ve got it under control. But in reality, some variables in the teaching equation are always in flux. I’m especially aware of this as I start a new position at a new institution that is trying to be intentional about how the world is changing and how they should respond. During our development week, we heard a speaker who talked about how some jobs exist now that didn’t four years ago, and some have all but disappeared that existed four years ago. That made me stop and think about what I do (or don’t do) to keep learning about those changes. Part of me wonders how people might foster a workplace culture that views work or “a job” as dynamic rather than static. After all, solar eclipses are not an aberration from normal but one remarkable stage in a constantly rotating system. Okay, that last bit sounded a little cliche to me, but I hope it makes the point. What a wonderful post that draws attention to the rich, thought-provoking variety of OGE opportunities built into the UW-Madison Writing Center experience. Looking back on my time engaged with these learning experiences at UW-Madison, I’m struck by the importance of this constant, critical reflection. Can’t wait to hear more about your activity theory analysis of OGE work, Brad! Cheers to a productive, reflective academic year! Beautiful writing, Brad. And I love the idea of looking historically at the ongoing-education topics to see what they say about changing currents in the field, and about the culture more generally. You mention in your post the “subtle competition for participants” among the topics. I’d be interested to know which of the sessions have generated the greatest interest over the years, and what that tells us about where we were, and where we may be going. Thanks for this post, and for all you continue to teach us. What a great post, Brad. I liked going down memory lane, thinking about some of the wonderful OGE sessions I attended in my time at the UW Writing Center, as well as some of the ones I led. I think I learned as much–or more–from designing OGEs as from attending them, and it’s wonderful that you give graduate students the opportunity to think in that way. I was also struck by the spring 2017 offerings, which simultaneously reflect some of the most timeless instructional concerns and also respond to the immediate political realities of Wisconsin and the USA. I really commend you and the staff for showing how writing and teaching are embedded in social contexts–one of the best things about the Writing Center is how its tried-and-true methods are inherently flexible and adaptive enough to respond to the new realities students inhabit, whether technological, political, or cultural. Thank you very much for sharing, Brad. I remember the academic year 2011/12, when I had the pleasure to stay in Madison as guest researcher, as a complete ongoing education for me. I participated in so many staff meetings, workshops, mentoring sessions and ongoing education sessions that the ideas I took with me are countless. A general understanding that I gained in Madison is that we constantly stress that working as peer tutor is always ongoing education. This is important in three ways: It shows stakeholders what a high quality our tutors’ work has; it shows students how valuable and what an honor it is to work in the writing center; and it shows to everyone that working with peer tutors can never mean to let the tutors alone – because this work is part of their education, too. At the writing center at European University Viadrina our peer writing tutors usually have two additional ongoing education days per semester, very often prepared and led by peer tutors themselves. Topics during the past summer semester were “How to work with students who have to write papers in groups” and “Multilingual writing”. Furthermore, the writing center conducts usually one more fun-oriented team event per semester, like an excursion or a cooking session. Last summer semester, peer tutors had prepared “creative writing walks” through Frankfurt (Oder). Unfortunately, the weather was too bad to actually walk, but the team had a very funny write-in in a Café and wrote marvelous stories. Thanks for the trip down memory lane, Brad! @Katrin, I also enjoyed reading about the ongoing education and team-building activities your tutors have planned. Your observation that “working as peer tutor is always ongoing education” is also the major thing I took away from my time with the Writing Center and Writing Fellows Program. It’s a mindset that is easy to proclaim but harder to practice, and that’s why OGEs were so useful. The OGEs I remember as particularly fruitful involved collaboration between tutors/Fellows of varying levels of experience. These interactions provided an opportunity for participants to alter their perspective of an issue or problem: in keeping with the astronomical metaphor, OGEs occasioned a parallax view, in which the object is de-centered, shaken from the realm of what we thought we knew into that which we are always in the process of measuring, examining, and coming to know. OGEs told the novices “you’re getting there” while saying to the veterans “you’re not there yet.” Instead of being frustrating, these moments of realization were reinvigorating, I think, and were powerful reminders that tutoring never gets old. This is great, Brad. As others have already noted, I really appreciate the emphasis on a concrete takeaway from many of the sessions, as well as how they offer a way to tackle of-the-moment topics in a substantial manner (something I worry about when we only have time to scratch the surface of an issue in staff meetings). And I agree with Bryan above–I’m so curious to know what folks came up with in so many of these sessions! It’s wonderful to have this inspiration to keep looking for strategies that will help consultants engage deeply with important topics throughout their time in our centers. Thanks for your post, Brad! I was lucky enough to lead at least a couple of these OGEs, if I remember correctly. One in 2007, with Brad, Rachel Azima, Scot Barnett, “It’s Not All Linear Text Anymore: The Least We Should All Know to Help Writing Center Students Compose Multimodal Texts in New Media Landscapes,” and one with Brad and Annette Vee in 2008, “AVT: A Powerful New Medium for Online Writing Center Consultations,” in 2008. I don’t remember what AVT stood for, however. Advanced virtual teaching? Audio Video Tutoring? Aquatic Viper Training? And today at UW-Madison, you can visit the Writing Center to get help with multimodal writing like poster presentations. And I see that there’s a new Design Lab in the HCW Library that looks to follow the writing center model of instruction, so we were definitely onto something a decade ago! Thank you, Brad, for sharing this information! I’m currently programming our staff meetings and professional development options for Spring, and it really helps to see the topics you’re covering. It’s also nice to see the concordances–Paula hosted a fantastic session on growth mindsets, for example, last year, and one of our grad tutors has been working on a project that compares and contrasts (and collected data on) tutoring and teaching. Thank you for contributing to my ongoing education, as always! And those sunflowers look gorgeous. I didn’t know that was/is a thing in Madison, but I just visited the Kansas edition in Lawrence! I had a profound ongoing education experience at the Writing Center in 2008. It required having one of my conferences videotaped, and then I sat with Brad and analyzed it. It was one of the most important and humbling professional development activities of my career. I now sometimes work with the writing tutors at Lafayette, and from time to time I will show them the tape of my conference and have them talk about things I did well and not so well. It’s a great way to help teach tutors about the power of micro-interactions in conferences. It is, also, a depressing visual reminder to me of how much older I’ve become since graduate school. Like so many who’ve posted here, I am grateful for my past experiences as both a participant and a leader of OGE sessions, and I know the impact of some of these opportunities can really be transformative. For my OGE one semester (many, many years ago), I elected to observe online writing center sessions because I was so skeptical of the platform. Of course, what I saw in those sessions completely changed my idea of — and attitude toward — online tutoring. As my own center’s population of graduate tutors grows, I am increasingly aware of how important it is to capitalize on their energy and eagerness for deepening their tutoring practices and contributing to the life of the center. What I especially liked about some of the sessions you describe here, Brad, is that they meld two elements I have tended to separate: 1) ongoing tutor education and 2) special tutor projects/deliverables (which everyone on our staff produces). Treating these two aspects of writing center work as related — even as on a continuum — makes absolute sense (now that I see it!). Thanks for another “light bulb” moment on the blog! Thank you for this post, Brad! I learned so much these sessions when I worked in the WC because they offered such profound opportunities to reflect on our work – and they also helped me to move more confidently into the role of a professional scholar and teacher. I find that in our WC at Catholic (where we have a graduate program in literary studies, but not composition/rhetoric), we sometimes have to work to show our grads how and why WC work is so incredibly valuable to their professional development. As a result, our ongoing education is a mix of topics designed to educate those members of our staff who have very little (or no) previous experience with writing centers, and topics for instructors who are extremely interested in this work, but are also not institutionally supported to pursue it in coursework. One of the things I love about this post is seeing the evolution of the topics and the format at Madison, because it’s encouraging to me to see that steady growth, even at in a writing center that already doing so much in 1997 . We’ve been working on expanding our vision and our program here at Catholic since 2011 and there’s so much more that we could do, particularly in terms of improving our ongoing education, so this archive is encouraging and inspiring, rather than simply daunting! Thanks for this wonderful post, Brad! Like Cydney, I’m currently developing our staff meeting schedule for Spring, and it’s really helpful to see your list of topics and to read comments about other approaches to ongoing education. Your post also brought back a lot of memories for me. Although I was an undergraduate Writing Fellow, many of the topics listed for graduate tutors look familiar. In 2011, for example, I attended a Writing Fellow OGE session on representing our work in meaningful ways in professional documents, such as resumes, cover letters, and application essays, and it continues to be one of my most memorable professional development experiences. I still use my notes and handouts from that session. I’m so grateful for the opportunities we had to collaborate with one another in OGE sessions and the opportunities we had to collaborate with graduate tutors in Writing Center/Writing Fellow joint staff meetings. Thanks, Brad, and I look forward to seeing you in Chicago! First, many thanks, Brad, for the generous mention of my new book here. Part of what impresses and embarrasses me in equal measure is the careful history you’ve kept of your writing center’s efforts toward ongoing tutor education. I say “embarrasses” because I have not kept such a detailed archive of the writing centers I have led. I’ve not done it, I suppose, because I’ve not seen this aspect of our institutional history as significant. This blind spot is all the more humbling because, as it turns out, I’ve made a career in writing centers preoccupied with tutor education. That’s one argument of my book, that we ought to pay greater attention to the mundane, everyday documents of writing center work, such as the “Rank Your Top Three Choices” of ongoing-education topics included above. The documentary history you’ve archived allows for the kind of analysis you’re developing here. Your list of ongoing-education topics tells you who you are as a writing center, what you value, what underlying assumptions or principles guide you. Bringing those principles to the fore, through documents like this, is an invitation to reaffirm some values, and perhaps reassess or challenge others. In addition to keeping a history of your writing center, this catalogue of ongoing tutor education reflects the value of including tutors themselves in directing and determining their own education and professional development. Tutor choice is front and center. Also, the agility Neal mentions above points to the spirit of inquiry and learning that motivates tutor education in the UW Madison Writing Center. There is always something new to learn and discover about writing center work. Another key principle evident here is that writing centers should be places that create rich opportunities for students to become leaders, engaging in authentic tasks, such as designing and leading ongoing education, that genuinely challenge them. Finally, sharing your local writing center documentary history is incredibly valuable. Going public invites other writing centers to examine what we’re doing and perhaps to try out ideas you’ve refined over time, then modify them for our own contexts. This sort of shared innovation, with one idea evolving from and building upon another, is what makes our work so endlessly engaging. As I look at your history, I’m confronted with my own. One difference I see is that I’ve not always created structures for tutors to make their own choices. Rather, the important choices have more often been mine alone. For me, that’s an uncomfortable recognition, and a challenge, perhaps, to loosen my own grip going forward, to trust tutors to make more decisions for themselves about the direction of their ongoing professional development. Thank you for sharing this, Brad. I found your comment not only enlightening, but also quite moving on a personal level. The example Brad sets with his way of directing a Writing Center has been and is an “ongoing education” for me. I am especially impressed by the way his peer tutors and writing fellows actively participate in the OGE model. The effect of what they “took with them” (to allude to PWTARP) shows itself in this commentary section and I am reminded of “The Map” in Brad’s Writing Center where every pin head symbolizes someone who has been trained or worked at his WC and who is now somewhere else, carrying the knowledge and spirit to another place. I will get a copy of your book, Mark, and I am sure that I will learn a lot from it. A few OGE experiences that have stayed with me are those that allowed me to witness other teachers in action. I remember observing now-retired WC academic staff working with a second-language dissertator and being impressed by how knowledgable she was about the student’s first language. I also remember sitting in on one of the WC’s grammar classes and seeing how the first page of a novel could serve as a springboard for teaching about punctuation. These were all educational experiences for me that have certainly been on-going. Oh Brad. Thank you for this opportunity for retrospective appreciation and a glimpse of what the students have been dedicating themselves to. Like Dave (Stock) and others, yes, I valued a mirror being put up to my abilities: so formative and instructive–it’s such a great pedagogical boon to observe how others see you, and to discuss what can be learned by working with another experienced teacher about how to grow as a teacher and tutor. When I think back to all of the ongoing education work that we did, and led, I valued the experience of experience. What I mean is that the Writing Center was so central to my professional development experiences, to my reflection on pedagogy, and at a deeper level, to consider what it means to teach and to learn from and with others. Professional development is an important part of my life as a professor. It’s a vital part of how we continue to grow, learn, and reflect on what we do as faculty. Lastly, this list is a testament to the inspiring and thoughtful work that students are encouraged, and expected, to accomplish as tutors. Truly, working at the UW-Madison Writing Center, yes, has made education an ongoing way of looking at how students and I work and learn in the world. Thanks Brad. Thanks to all from whom I learned. One advantage of commenting late is the opportunity to read so many thoughtful remarks from colleagues near and far! Like many others, I feel I learned *so much* about teaching from the UW WC, and the OGEs helped with that considerably. Beyond the content of them (which was, in my experience, always top-notch), it was the ethos: you are always learning as a teacher, and should be always learning. Tutor training wasn’t an “inoculation” model, in the same way that the field of C/R has continually reminded us that FYC isn’t. I also found it useful to run or co-run a couple of OGEs. The leadership opportunities the WC provided and the process of training other tutors helped me transition better to a faculty position where I was working with grads. All of it invaluable! Thanks to Brad and the rest of the WC for making these opportunities possible, and also for sharing them here! Thanks, Brad, for sharing these artifacts from OGE–which I, like so many of us remember fondly from my days at Madison (in the “historical” list of topics). The model for tutor involvement in professional development that you describe is one of the many “things I carry” with me in my work now as a writing center director. I remember feeling as a graduate tutor like I wasn’t an expert and thus couldn’t lead; who was I to facilitate conversation with people who knew more than I did? Remembering that helps me understand my tutors’ reluctance now, and also makes me sure that they, too, really can do it. 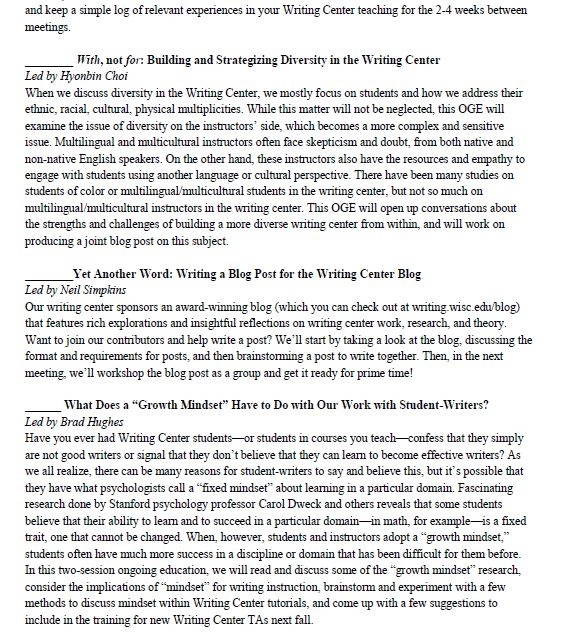 Though the OGE topics from the 90s don’t show the focus on diversity that the more recent ones do, it was in the Writing Center/Writing Fellows program that I first started thinking on a practical level about how to teach inclusively, with students from diverse identities and diverse literacy backgrounds. I’ve spoken with several former colleagues about the challenges of institutional memory in Writing Centers, and this post is fascinating in that context. I may have spent the last five years with the UW-Madison Center, but I didn’t know how the range of options (not to mention their naming conventions) had changed over the years. I particularly appreciate that history as an incoming Assistant Director. Beginning in December, I’ll be working with a program looking to further develop its OGE options, and this serves as a reminder of how much time programs need to establish and develop the on-going education that fits their specific context. Here, “Writing in the Sciences” morphed into “Science Writing as Storytelling, Telling Stories about Science Writing,” but the transformation may have taken a different form at an institution with its own, distinct needs. In other words, this post inspires ideas, flexibility, and patience. Like Annette, I am reaping the benefits of my delayed response: namely, the opportunity to read all the marvelous comments. Throughout them all, I find not only a shared intellectual curiosity about a wide range of issues (technology, building a diverse staff, etc. ), but a genuine fondness for the opportunities to learn together. Not for nothing–but this blog is yet another instance of Brad’s commitment to facilitating that kind of ongoing conversational (and critical) engagement. And like Mark, I am a bit embarrassed by how difficult I would find it to create such a list at our writing center, even though I’ve only been directing for about seven years. In fact, we’ve just created a new “archivist” undergrad intern position to help us think through how much we need to organize the artifacts of our past work. All those videos, all those staff meeting materials, all those course materials: how do we keep track of them not only in the moment, but over time? A post like this convinces me that it’s not just navel gazing to try to organize our past as a way of looking forward to our future. Thanks! This week I was meeting with our Writing Center director about developing a Writing Fellows program when we got on to the topic of Writing Center consultant training and opportunities for further WC education. We discovered that the consultants were already “unofficially” doing some of this work on their own: talking with each other about sessions, keeping up on relationships with specific repeat students, etc. This post goes to show how important it is to have these sort of records not just for individual tutors, but for future tutors who can reflect on – and employ – similar strategies. Thanks so much, as always, Brad. I love hearing about the multiple dimensions of the writing center and seeing the contributions of the many people who work at the writing center. One of the valuable experiences that many of our graduate students gain is through the professional development and instructional training and support that they get which helps to build their foundation as teachers and scholars. I know that the experience that the writing center provides only helps our graduate students when they teach writing in one of our composition courses or work with students in literature or English language and linguistics.